Salad is the most simplest way of utilizing any vegetable or fruit found in the refrigerator. Combine any veggie and fruit, toss them with any dressing and the salad is ready to be served. Salads high in Vitamin C are an important part of a healthy lifestyle. Use fruits and Vegetables in your salads with a low glycemic index as that is good for fat burning and suitable for diabetics also in most cases. Opt for salad dressings which use zero sugar and maybe a bit of honey. These Vitamin C rich salads will help fight body inflammation and up your fibre levels which will slow down the digestion keeping you fuller for a longer time. Try from the wide variety of salads like Lettuce and Apple Salad with Lemon Dressing, Grapefruit and Green Apple Salad, Cucumber Pineapple Salad, Garlicky Cabbage and Spinach Salad. Gain your share your vitamin C and other antioxidants to stay away from cold and build a healthy immune system. Serve these salads as a part of a meal or in between snacks, but remember to serve it immediately as Vitamin C is a volatile vitamin and has minor loss on exposure to air. 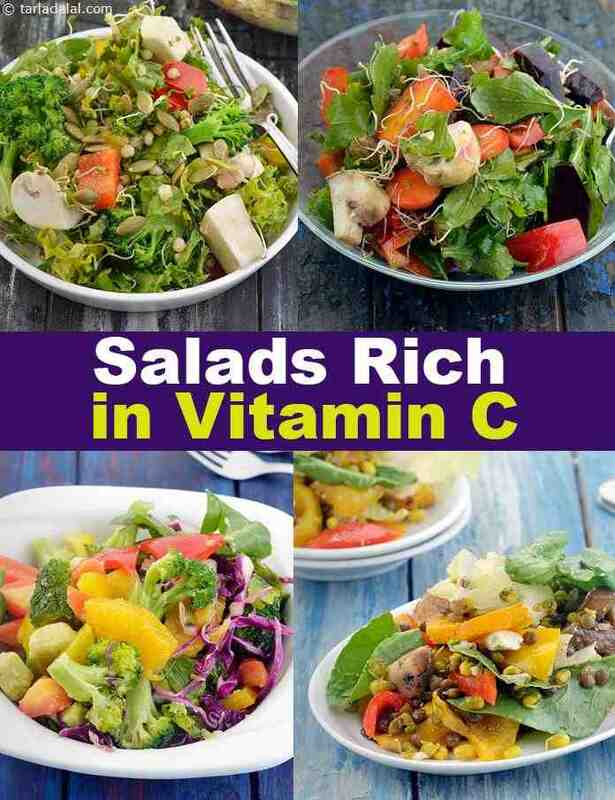 If you like this article on High Vitamin C Salads, then you will enjoy the below articles on Vitamin C rich recipes. A signature kerala dish…super easy to make, good to look at, nutritious and delicious are some things going in favour of this dish. Loaded with coconut, usually, here we have used only 2 tbsp and yet maintained the taste. Poriyal is any dry vegetable preparation flavoured with generous amounts of fresh grated coconut. Cabbage tempered with mustard seeds and dry red chillies makes a delightful accompaniment to any South Indian main course. Nutritious sprouts pairs well with invigorating orange and tomatoes, balanced carefully with sweet bananas and grapes. Delicate spices weave in and out of the sprouted fruity bean salad, taking the user on a culinary adventure. Cucumber pineapple salad, light meals to feel light and healthy! all the ingredients used provide nutrients like protein, vitamin c, iron, vitamin e, a potent antioxidant to fight free radicals produced due to stress. Stress may affect overall health hence these nutrients fight it all to keep you.